I've been pretty pumped about Titans for a good long while. I mean, with a freaking awesome premise like this paired with the fact that Victoria Scott, one of my favorite authors, wrote it, how could I not be? So I basically was bouncing off the walls when this book landed in my mailbox. And then the excitement returned again when it was finally time to sit down and read this baby. Lucky for me, all that excitement was 100% warranted, and I LOVED this book. What captivated me first and foremost about Titans was the premise. A girl named Astrid racing in the Titan Derby so she can use the winnings to save her family's home (and, ultimately, bring her family together). Everything about that was something I wanted to read. The races, of course, which were intense and always so very fun to read. And Astrid's struggle, something I found easy to relate to and understand. Within the story, there are several characters that make it a joy to read. Astrid, the main character, who is smart and strong and a great narrator. I enjoyed being in her head while she told her story. Magnolia, Astrid's best friend, who is quirky and fun and a total fashionista. Rags, who begins as an old man giving Astrid a chance but grows to be so much more. I adored him, and his moments with Astrid were some of my favorite. Hart, who I totally admit to having a crush on. And then there's Dottie and Barney, both characters who help Astrid while also adding lightheartedness and laughs. And then there is Padlock. No way I could forget about Padlock. He honestly deserves his own section as one of my favorite aspects of Titans because dear goodness, I am head over heels for this steel horse. He wormed his way into my heart and I don't foresee him leaving anytime soon. Or ever. Truly, if you need one reason to pick up this novel, Padlock could totally be it. He's worth it. Victoria Scott's writing was stunning. The entire book had a very specific tone to it that caught my attention from the first page and kept me hanging on through the last word. It was intense and lovely and I enjoyed every moment of it. The story begins with a peek at the Titan races before Astrid joins them, and then dives into Astrid's life and what leads to her jumping on her own horse. There are several races throughout the novel, and they didn't all come at the very end, which I loved. The first race happens less than 100 pages in, and then there are a few more after that with other aspects of the story -- like training and other aspects of Astrid's life -- in between. Those other aspects of the story were both interesting and enjoyable, as well. Seeing Astrid's friendship with Magnolia, and her growing friendships with the people she meets in this novel, was fantastic. Astrid's family also has loads of moments, and those facets of Titans were some of my favorite to see evolve throughout the story. Romance is not a huge part of Titans. There are some romantic elements on the side, but the Astrid does not have a romance herself. Honestly, this was something that worried me when I began reading. I had every confidence that I'd like the book, since I was already sold on the premise, but I'm a reader who strives on romance. If there wasn't much to speak of, surely my reading experience would suffer, right? WRONG. Wrong, wrong, so very wrong. There were so many other things going on in this story (Titan races, friendships, family) that the lack of romance for Astrid was not something I was concerned about. 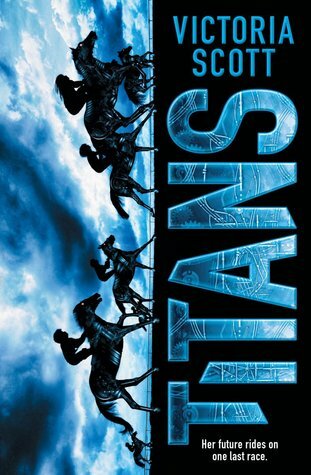 I was pulled into Astrid's life and the races and Padlock, and fell in love with Titans. So if you're worried about romance in this book the way I was, pick it up anyway and give it a shot. Overall, Titans is an intense, gorgeous story that totally made me cry. I loved everything about this stunning novel, and I definitely recommend picking it up! 5 stars - Intense and full of heart, fun and absolutely stunning. I definitely recommend picking this one up! Five winners will receive a finished copy of Titans! US only. Ah! Thank you so much for this. I'm so excited for this book and I hope I win a copy. Heard a lot of hype about this one! Love the cover, and the story just sounds amazing. Thanks for having the giveaway. I pre-ordered this months ago. Just days away until I get that beauty in my hands! Loved your review! This book sounds great! Thank for giving us a chance to win a copy! Awesome review, and thanks for the giveaway! I can't wait to read this one, it sounds amazing! Wow! This sounds like another stunning read! I know Victoria builds her worlds so well, despite lacking romance! Great review!